And I would love to know where to get the elastics from that your friends send you for your stamp carving. I am always looking for a good material to carve stamps with and have not found anything suitable in Germany so far. :( I don't even know what kind of tools are best. Where does your boyfriend think the elastics should be? I guess you could put them on the back like they are carrying a backpack? But I love them just the way they are! oh my! they are just adorable! i want to make some books now too - thank you for the inspiration. 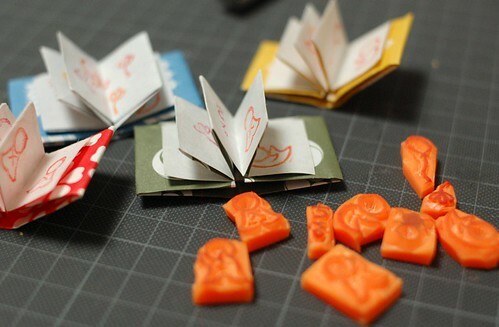 i have many small image stamps which would be just right for this project. they are so cute, you must have a lot of patience working with such tiny things. 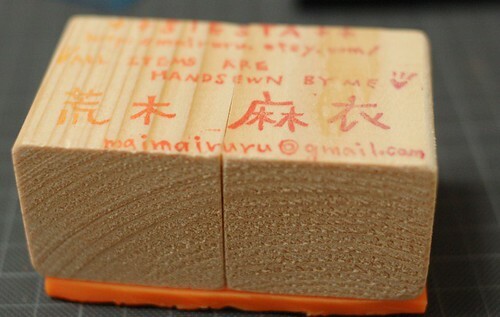 have you tried the stamp keshigomu? you can buy it in the ¥100 store. They are lovely!! Very clever! 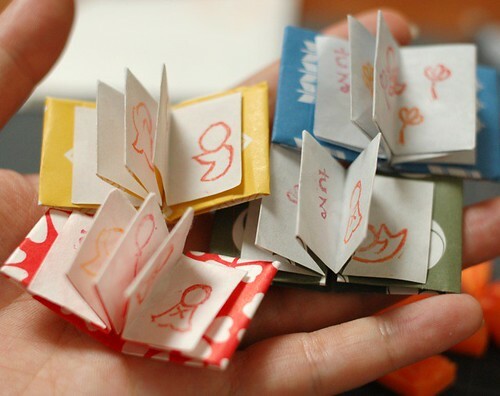 Lovely Mai, you inspired me to want to try craving my own stamps too. But i have yet to find any craft stores that sell these tools. Will keep looking. 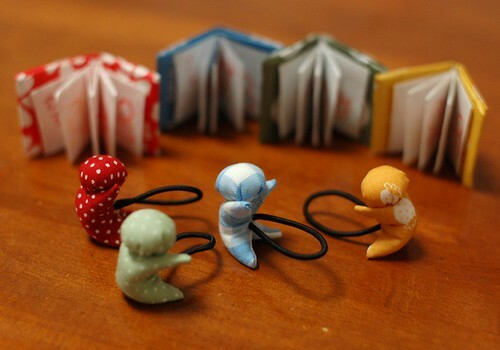 :) Your sarubobo bands are adorable. Love them. Have a lovely merry happy day and love to you! The eraser is this one. I'll write here how I'm carving with my cutter knife (* v *)!!!!! 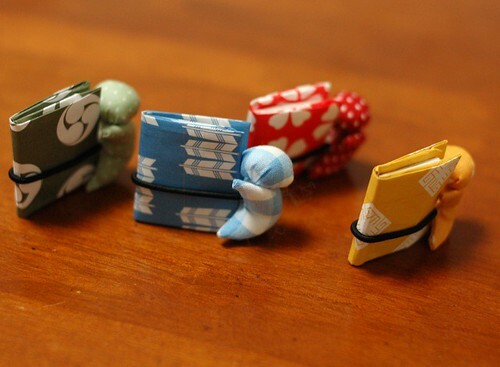 I love your little sarubobo with their teeny tiny books! Wherever do you get your ideas? Your talent amazes me! Mai, I ve been following your blog for a few weeks now and I love it so much !! !You sound like a wonderful warm hearted, generous person and I love your creative ideas.Plus I am just crazy about Japan and everything japanese.Thanks for sharing with us, your blog is definitely among my favorite. 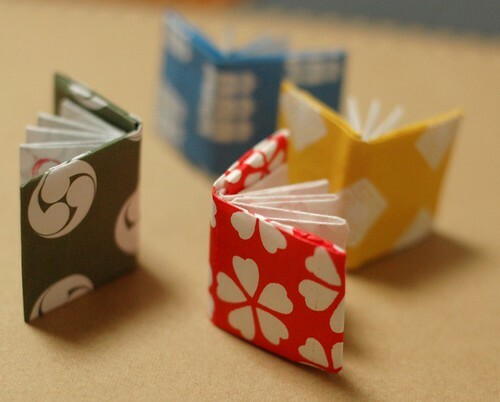 These lil'books are sooooo cute ! 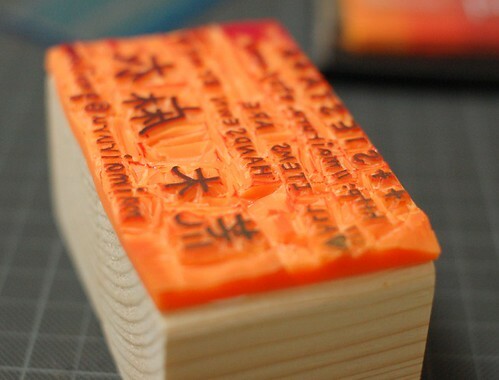 They already shipped it, I should be getting it soon, I cannot wait to try carving my own stamps.Thanks again Mai, for sharing your amazing creativity. Your creativity is boundless! I like the elastics the way you have them. Can these double as hair elastics? It would look so cute to have a sarubobo holding a pony tail. They are very nice, I like them and the saarubobo are just adorable. I am sorry but I am french and I don't speak very good. They is a mistake with my adress. 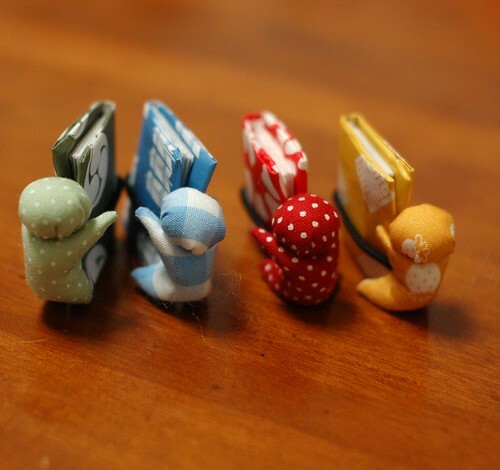 Oh my, Sarubobo hugging the mini books are so kawaii!! that must be a lot of work Mai! wow! and the sarubobo with the elastic on the tummy... it's OK i think, looks kinda cute like they are playing hula hoops ! Nice work! Sarubobo tachi are so cute! I am wondering if you could help me out with some Japanese>< I can read some Japanese, so I bought a Japanese craft book, but not sure what it means when it say 見返し, could you explain to me please? The elastics are for hair. It sounds cute! I wrote how to make a sarubobo plush before. It's not so difficult. Please see my previous post. "見返し" is for example, flower print fabric of this picture. It should be "facing" in my dictionary (I'm not sure...). I thank you very much, I found it. ありがとうございました! I think I get it now.. I just wasn't sure if it was a specific type of fabric that I have to use for 見返し! These are the cutest! I love tiny things!